On Sunday 25 June Brighton Housing Trust is to host an extraordinary, mass-participation fundraising challenge at Preston Park Velodrome. In just twelve hours cyclists of all ages will take to their bikes to collectively cycle 66,792 laps of the historic track, which is equivalent to the distance around the world. The very first lap to count towards the challenge was clocked by The Mayor of Brighton & Hove, Councillor Pete West, and his Mace Bearer, Robert Robertson, who launched the Around the World Cycle challenge with a lap on their tandem. They were supervised by Andy Winter, Chief Executive of Brighton Housing Trust. 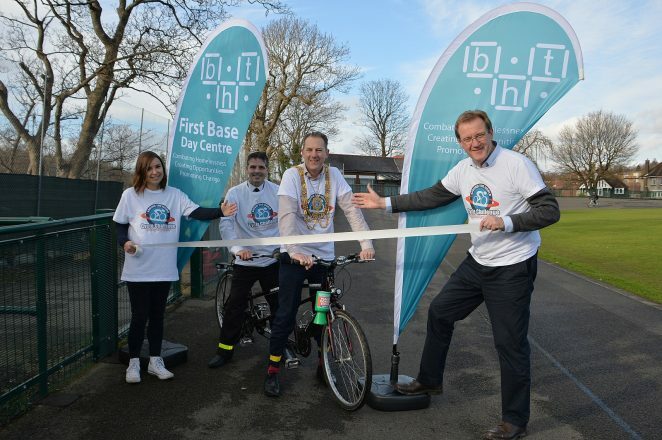 It is hoped that this unique event will raise £25,000, to enable First Base Day Centre to continue to help people to move away from the streets, and on to independent and healthy lives. Every penny raised will go towards providing food, health services, showers and laundry facilities, and most importantly person-centred advice to help find accommodation and employment. With various cycling slots for children, adults, hand cyclists and adapted bicycles, and club cyclists, this family-friendly challenge is something for the whole community to get involved with. There is even the option to take part on an exercise bike at home or at the gym.